When the time comes for you to play a more talented team, be sure you know the right strategy moves to make. You might be surprised to learn that your strategy actually changes based on the talent level of your opponent. Make sure you know exactly how that works. Throughout a season you’ll play a number of teams that are either more or less talented than your own. Each requires a different approach and is based on your likelihood of scoring. First, let’s look at a More Talented Opponent. This team will score more easily and more often against you, while making it extremely difficult for your team to score. And while this can seem like a hopeless situation, it’s that very feeling that will dictate your aggressiveness. Because it’s unlikely you’ll score, you’ll have to coach very aggressively and take lots of chances. You’ll have to stretch singles into doubles and send runners home when you might otherwise hold them up. You’ll have to steal your way to 2nd and probably steal 3rd as well. You’ll want to call for more running plays – meaning hit & runs and squeezes, since your team’s ability to get multiple hits in a row will be slim to none. Defensively, you can’t afford your more talented opponent to get many runs so you’ll have to take chances defensively by trying for the lead runners when otherwise, you might not. If you were a football team you’d have to go for it on 4th down. The better the team you’re playing, the bigger the risks you’ll have to take. And even then, it might not work out, but at least you will have have given yourself a chance. On the flip side, playing a Lesser Talented Opponent means your chances of scoring will be very high and their chances of scoring against you will be slim. So be patient. You don’t need to take chances so play it safe. 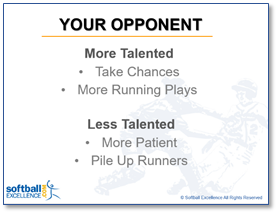 Hold runners at 3rd so you can score multiple runs on a single instead of only scoring 1. You don’t want to give up outs for bases so avoid calling many offensive plays. Pile up runners, go for the easier outs and play it safe. Let your talent win the game instead of your risk. HOLD ON – if you’re a Vault Classic member then ALL of these eClinics are already in your locker ready for you right now! If you’re not, then join in on the incredible savings and become a Vault Classic member now. We’ve got a world of information, education and tools at your disposal! Join now!